Opened in December 1938, the Lyceum was built on the site of the earlier Lyceum Theatre, which had opened in 1899, and burned down in 1937. The replacement building, by McNair & Elder, was a stunning streamlined suburban super-cinema, originally seating 2,600. The booking was performed by AB King, as with so many other halls in the west of Scotland. The main entrance, on the corner of Govan Road and McKechnie Street, is below a three-storey high curtain-wall frontage of five tall glass windows, which were originally backlit. The rest of the public exterior was tiled at ground level, with bricks above, and a strong horizontal emphasis. The circular entrance foyer had a central island paybox, from which patterns radiated in terrazzo on the floor, and a mural ran around beneath a central light fitting. The auditorium was originally decorated in blue, pink and lilac. 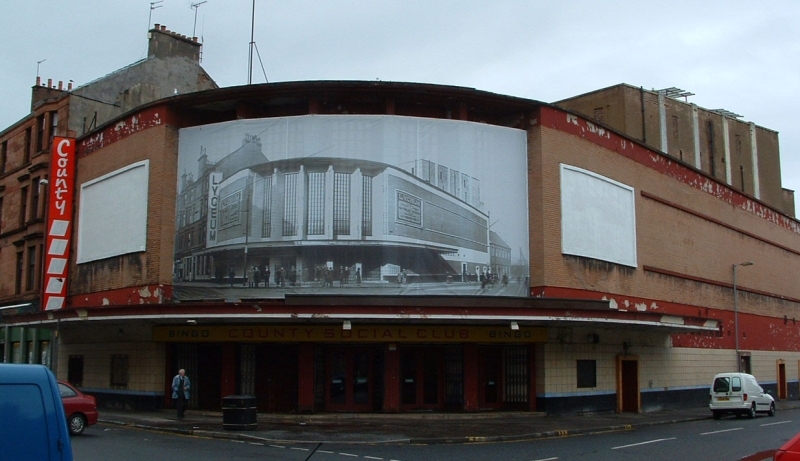 Sold to County in 1974, the auditorium was split with bingo in the stalls, and a 480-seat cinema in the balcony. The circular foyer was split in half, with a wall running down the middle, providing seperate entrances for the cinema and the bingo. A new mural, featuring Disney characters, replaced the original one on the cinema side of the foyer, while on the bingo side, the original was simply painted over. 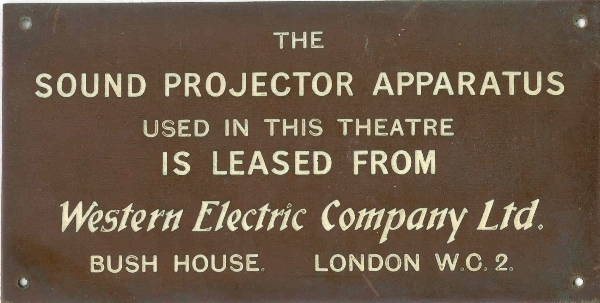 The original paybox, pulled to one side, continued in use until the cinema portion closed in January 1981, although the bingo operation remained open, and continued to be run by County until 2006. In January 2006, County sold all their remaining properties to Gala bingo, who said that 'all the sites will be refurbished and rebranded as Gala bingo halls'. 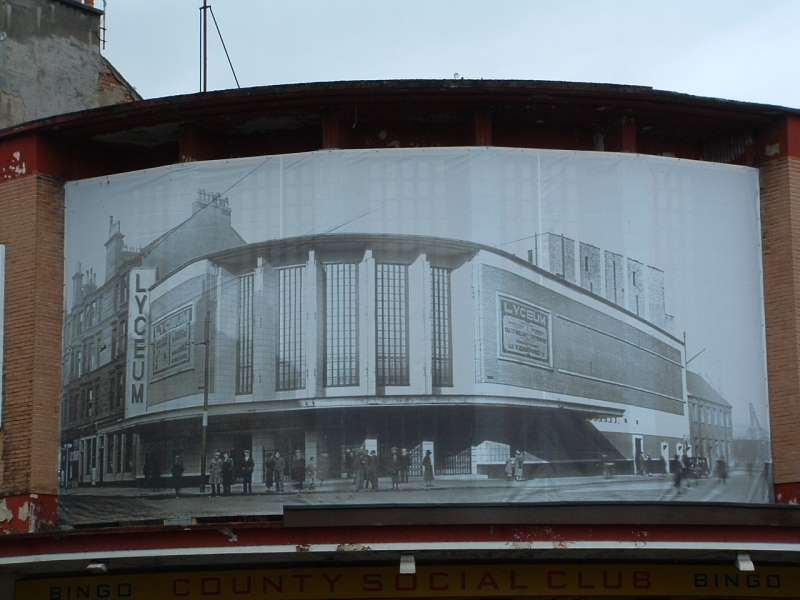 The B-listed building, which is looking increasingly run-down and dilapidated, has recently been partially covered by a banner showing the cinema in happier days. Unfortunately, Gala closed the Lyceum on October 8th, 2006, and the building is now for sale. As can be seen from the photos below, the cinema portion has lain untouched since it closed, and despite various alterations, much of the building original decoration survives intact. It is now on the Buildings at Risk list. Side view and rear view of building also available, plus this 1980s exterior courtesy Chris Doak.